I'm going to be tabling at SF Zinefest this coming weekend, and I will be selling my (almost almost finished) new mini-comic Second Banana! There's a fair chance I'll only be there on Saturday, but hopefully I'll be admiring the punk haircuts of crafty girls in granny glasses from behind our little table both days! If you can make it and want to say hi, just turn right as you enter the main hall, I'll be at Table 66 with the fabulous Kane Lynch gorging on vegan donuts. The hours are 11-5 both Sat and Sun. Admittedly, mini-comic printing has been rocky not just because my printer is a temperamental beast but I've been trying to up my game in terms of scanning and printing. The downside of being haphazardly self taught is you only learn things you happen to run across and even then only if you decide to care, and I haven't cared a whole lot about the details of this process until recently. Now by obsessively reading Dustin Harbin's amaaaazing blog and the Comic Tools blog I'm hoping to do some catch up, but it's a (surprisingly/embarrassingly?) long road. In fact I've assembled a terrifying master list of new tools to get and try out. Scary. Fun. Anyways, enough rambling. 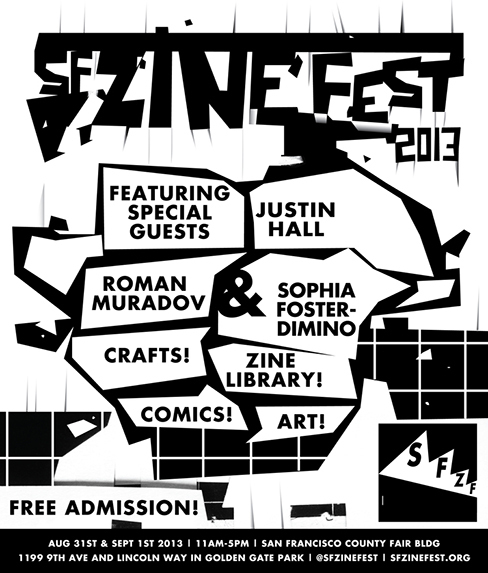 Hope to see you at zinefest, lovely people! Newer PostNew Mini-Comic Second Banana! Older PostNew comic for SF Zinefest!